Shrimp pesto pasta is a must-try dish this spring. 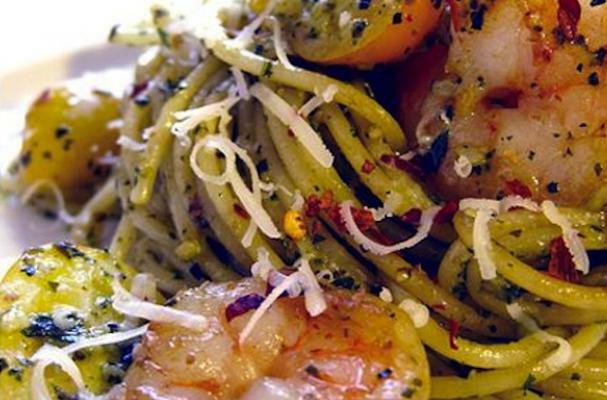 Strands of spaghetti are tossed with an Asian-inspired pesto and succulent shrimp. The pesto is made with the typical ingredients with some spice added including Thai chili peppers, mint, cilantro and lime juice. Make extra pesto to add to other dishes during the week including a spread for banh mi, an Vietnamese sandwich. Oil, Shrimp --Spoon enough oil from top of pesto to fill a tablespoon and heat in a large pan over medium-high for 1-2 minutes. Add shrimp and sear until each side is pink, 1 minute per side. Remove shrimp from pan and set aside. Final Steps -- Right beforeserving add fresh grated Parmesan cheese. Enjoy!